It might surprise you to know that Japanese anime first appeared roughly 100 years ago in 1917, but anime did not really begin to take off as a thing until the 1960's. During the last 50+ years, we have seen American catgirl icons, such as Catwoman, make waves in the fashion world. Today, we are living in a time when catgirl anime fashion trends are an all-time high. Cat ear headphones are a natural progression of this fashion trend. In fact, it makes me wonder: "Why didn't someone invent these headphones years ago?!?" 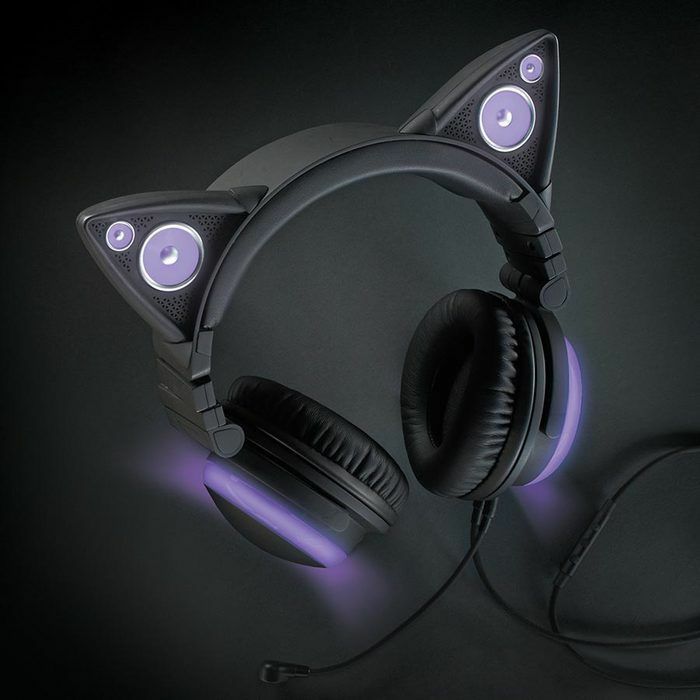 In 2019, several brands are making nekomimi-inspired cat ear headphones: Brookstone, Axent Wear, Censi, MongDa, iClever, etc... Each brand has their own take on the neko cat girl style, and each model in this list has distinct design and performance qualities. If you are searching for headphones with astonishing sound quality or if you are a snob about headphones and sound quality, this is probably not the list for you. None of these cat ear headphones are going to rival ultra high end performance headphones. 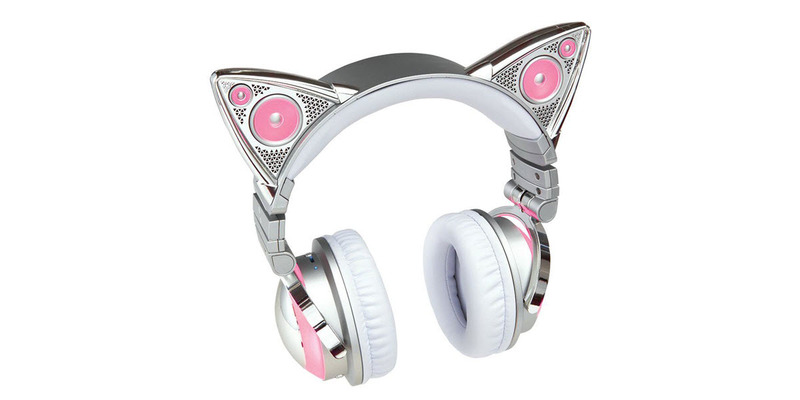 These headphones are all about the anime / neko / manga cat girl style. That being said, the headphones on this list sound fine to me, but admittedly I am not a audiophile. Additionally, I would not have included any of these headphones if their sound quality was bad or poor. Finally, I like to listen to music several times throughout the day, and one of the things that I really value in my headphones is durability. Style is a must, but I also need headphones that can withstand the wear-and-tear of being packed into a bag or backpack several times a day. I often wear my headphones while I am out walking or at the gym, so I need headphones that can survive the elements in those environments. 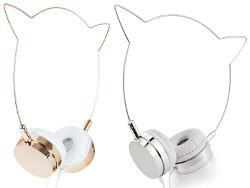 Why are the Skinnydip x Zara Martin kitty headphones and Emio Mix-Monsters Cat headphones NOT on my list? 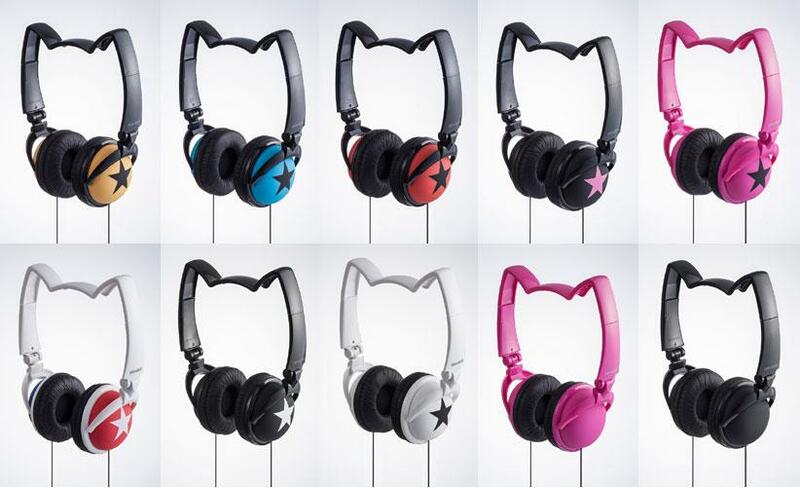 The Mix Monsters cat headphones from Emio are a slightly different animal (pun intended!). They are the only headphones I reviewed that are covered in a very soft, fur-like material on the headband and the earpads. I really liked that feature. However, these headphones feel very fragile. They seem like they would be perfect for kids, but I am not very confident in their durability over a long time frame. Simply put: I don't think they could withstand the daily wear-and-tear that my headphones experience on a day-to-day basis, and for that reason, I did not include them in my list. But if you are looking to buy a gift for someone, these are reasonably-priced headphones that are very cute and comfortable. 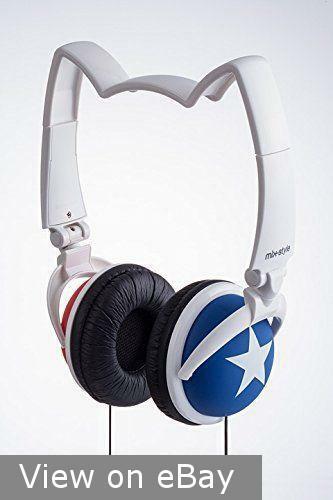 These headphones come in 2 color options (Black, White), and both colors are available at Amazon.com. After Wenqing Yan (a.k.a Yuumei) at Axent Wear raised over $3 million on indiegogo.com when she invented her first model of cat ear headphones, it was only a matter of time before a brand like Brookstone teamed up with her to produce a signature model of her cat ear headphones for a famous artist in the world of music. A partnership with with Ariana Grande made the most sense, as Ariana Grande has been a trendsetter in cat ear fashion phenomenon over the last several years. In an interview from 2014, she claimed that she went as a cat for Halloween one year, and she just kept on wearing the cat ears because she liked them so much. Oh btw - there is a debossed Ariana Grande signature on the side of the earcups. Out of all the models of cat ear headphones available right now, these are our #1 pick for several reasons. These over-ear headphones are one of only a few headphone models that are wireless with Bluetooth connectivity. They also have a built-in microphone, external speakers in the cat ears, and glowing LED lights. The LED lights can be turned on or off depending on preference, and there additional presets that allow you to set the lights to beat with the music, change colors every 5 seconds, or flash on/off continuously. 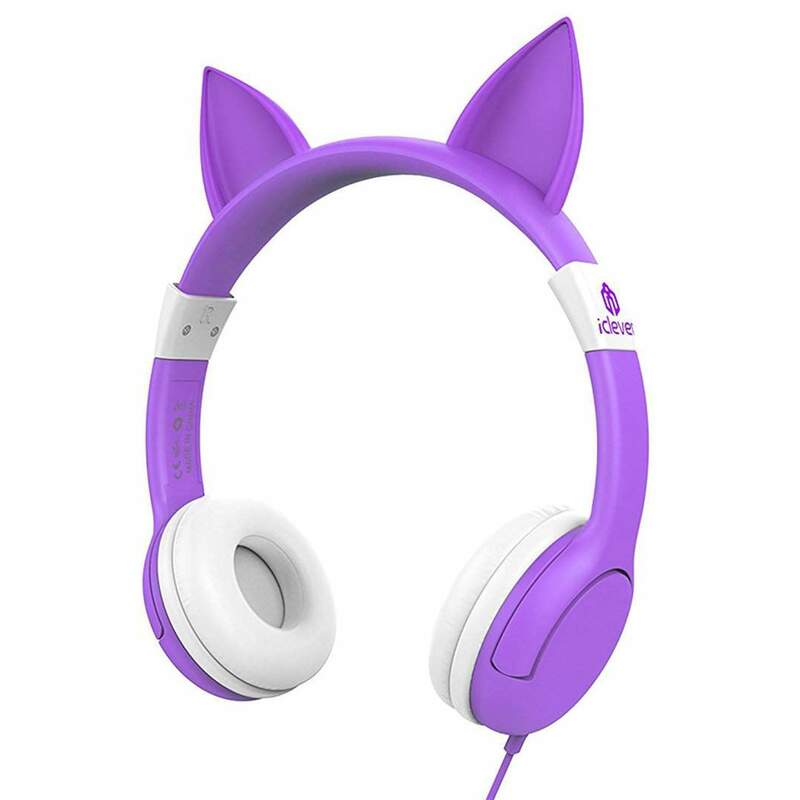 As for color selection, there are several options: Light Blue, Green, Orange, Ice, Lavender, Pink, Hot Pink, and Purple.These headphones also contain external speakers in the cat ears. These external speakers allow you have your music heard in the nearby vicinity, which is a nice feature to have, especially when you want to take off your headphones and still listen to music. Additionally, these external speakers operate independently of the speakers in the earcups on the headphones, so you can listen to the external speakers and earcups separately or together. When it comes to comfort, these headphones feel fantastic. The earpads fit over the ear, and the headband is adjustable. Because these wireless headphones have Bluetooth technology, you can pair them with Apple devices, such as the iPhone, iPad, MacBook, and iMac, as well as Bluetooth-enabled Android devices. One of my favorite features is the built-in microphone. I do not enjoy messing with wires any more, so the built-in mic was something that really made these headphones standout. As for battery life, the headphones are rechargeable via USB cable, and you should expect up to 5 hours of battery life per charge. Finally, let's talk about what comes in the box. First, the unboxing process with these headphones was fantastic. The box contains a limited edition carrying case with Ariana Grande's signature etched on the outside. The carrying case is a really nice addition. It lets you keep these headphones safe and protected when they are not on your head. The chrome design is also very cool. Inside the case, you will also find a 4' detachable headphone cable and a USB cable for recharging the headphones. Those are fairly standard items. I was glad they included them, so I don't have to search for other cables to use. Conclusion: While these are the highest priced headphones I reviewed, they are by far the absolute coolest headphones on the page. If you are looking for wireless Bluetooth capabilities, color-changing LED lights, external speakers, a built-in mic, and a chrome/white color option, these are the headphones for you. The external speakers are not very loud. 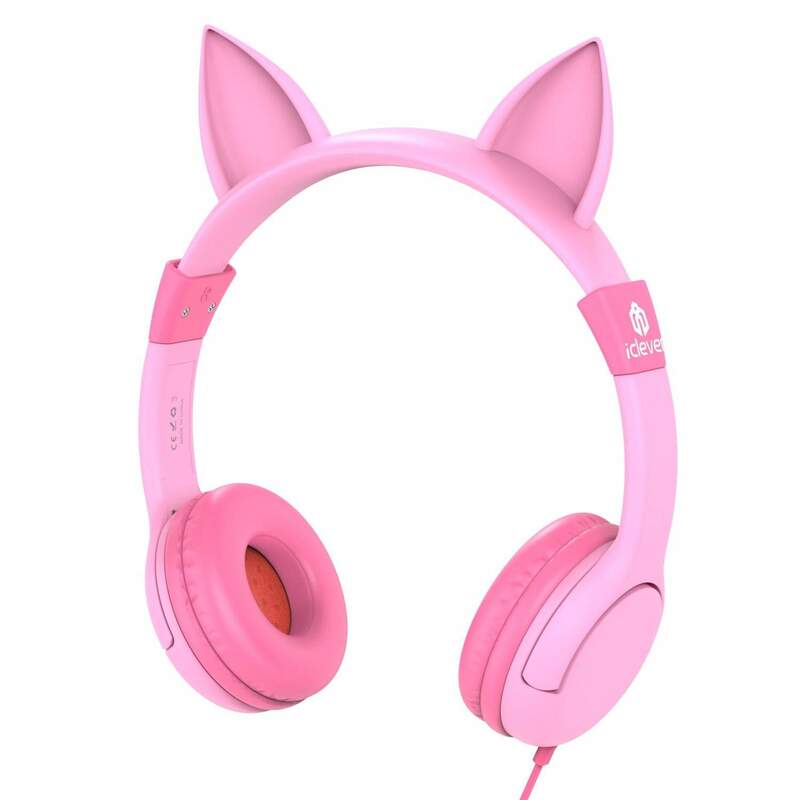 If you are not digging the Ariana Grande Limited Edition headphones, but you still want the design and functionality of the Brookstone / Axent Wear cat ear headphones, then these are the headphones for you. These headphones look more like the original design that Yuumei took to indiegogo.com. Instead of the chrome and white exterior, these headphones are black, which - in my opinion - makes the glowing LED lights pop more than the chrome finish. They also appear to look more like the traditional black cat ear headbands that are very fashionable right now. While these headphones are less expensive than the Ariana Grande headphones, you still get many of the same awesome features. Personally, the two important features for me are: 1) wireless with Bluetooth 2) built-in microphone and 3) the color-changing, glowing LED lights on the top and sides. Because these are color-changing LED headphones, you have the option of choosing from these 8 colors: blue, green, purple, orange, white, red, yellow, and pink. There are a few different light modes. Select one color or choose the option to change the color every 5 seconds. You can also have the option to select a standard flashing pattern or a pattern where the lights flash with the beat of the music. blue, green, purple, orange, white, red, yellow, and pink. ​Along with the Bluetooth capabilities for wireless listening, the external speakers are also a very nice feature. You can listen to your music in the headphones, turn on the external speakers in the cat ears, or play music in the headphones and in the external cat ear speakers at the same time! The external speakers are not very loud, so don't expect to use them to add music to a big party or anything. For me, the external speakers are the perfect volume for when I just need to hear a little music and I don't want to wear the headphones. What's in the box? When opening the box, you'll notice a pretty big, protective carrying case. Inside the case, you will find the headphones, a USB cable, and a standard headphone audio cable. These headphones are rechargeable via a USB cable, and you can expect roughly 4-5 hours of use per charge. 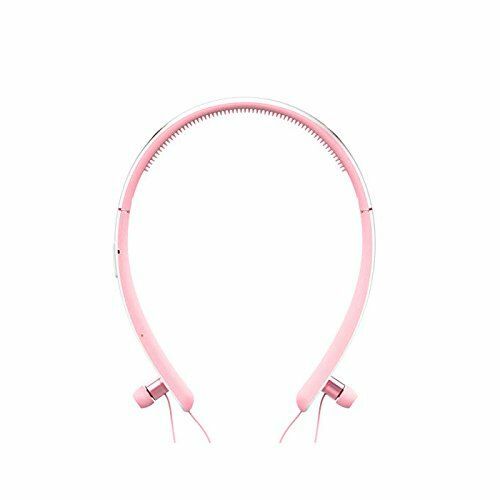 If you are looking for wireless cat ear headphones, but the Ariana Grande model is out of your price range, these headphones are the right ones for you. You can save a little money while still getting a lot of great features in a fantastic product. Conclusion: If you like the Brookstone / Axent Wear design but are not interested in the Ariana Grande signature headphones, these wireless Bluetooth headphones are for you. You can save money while still getting all the features: color-changing LED lights, external speakers, and a built-in mic. 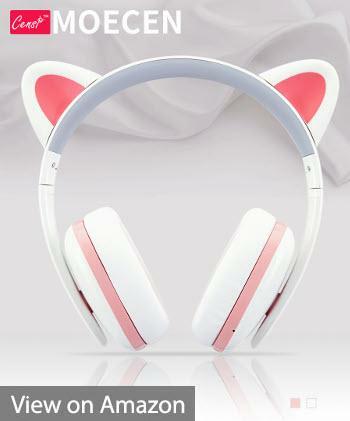 The wireless bluetooth cat ear headphones from Censi Moecen are so cute. 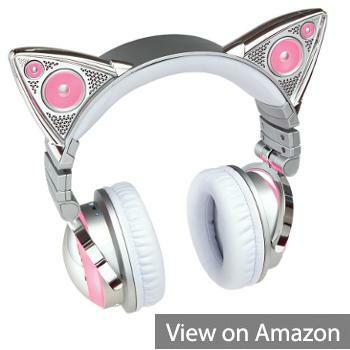 While they don't have the flashiness of the glowing, color-changing LED lights, these headphones fit much more into the catgirl style of neko / nekomimi / manga / anime. Because they don't have any lights, these headphones are much more modest, while still making a strong stylistic statement. Neko fans will absolutely love these headphones. One of the most interesting aspects of these cat ear headphones' design is that the cat ears are adjustable and removable. What?! 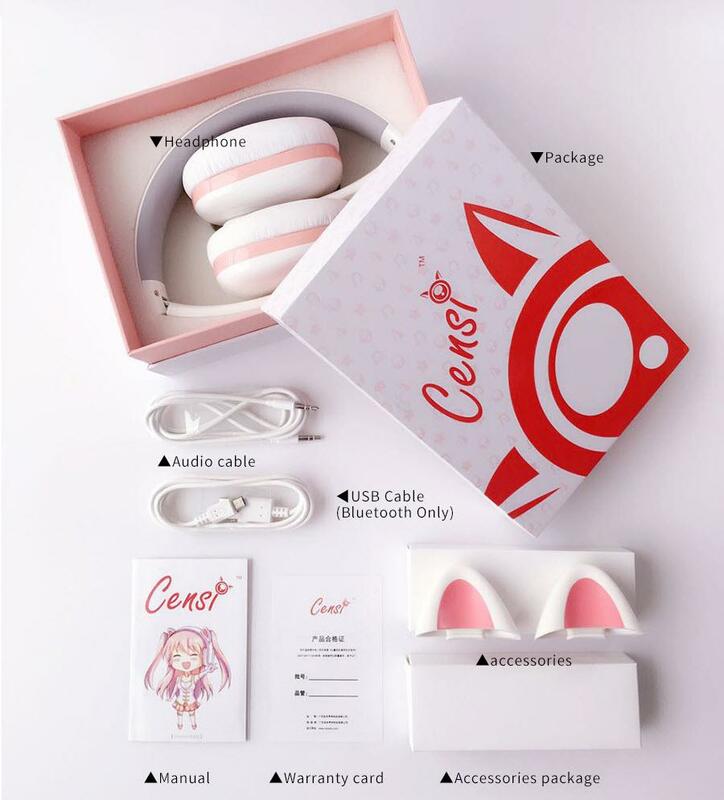 Censi actually patented the design of the removable cat ears. If you are in a place where you don't want to wear the cat ears, you can remove them very easily. The cat ears feel like they are very well-made and sturdy. I doubt they will break after adding and removing them several times. For me, this is a great feature because there are definitely some occasions (like when I'm at work) when I cannot wear neko headphones with this much personality. 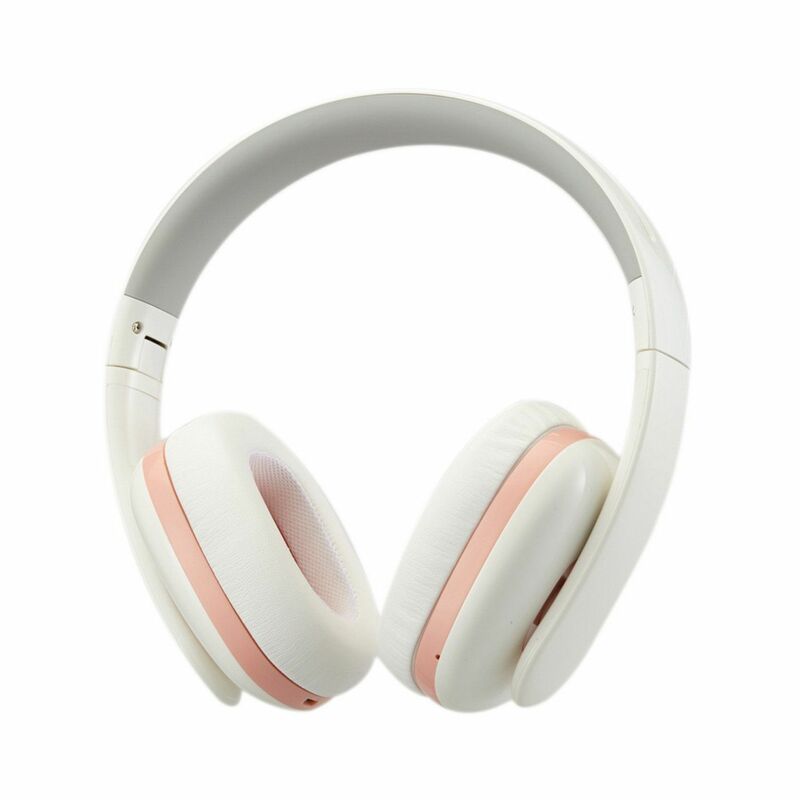 Additionally, these Censi over-ear headphones are available in two color options: 1) white/pink and 2) black/red. One of the most interesting aspects of these cat ear headphones' design is that the cat ears are adjustable and removable. If you are in a place where you don't want to wear the cat ears, you can remove them very easily. Because these headphones are wireless with Bluetooth, you can use them without a wire. There is a built-in microphone located under the left earcup. Also, these Censi over-ear headphones are noise-canceling headphones, and I think they do a very good job at filtering out various types of background noise. Another really cool feature of the Censi headphones is that they have been rated waterproof level IPX4, which means they are protected from splashing water, no matter the direction. What this really means is that these are sweat resistant - so you can wear them while working out and that you shouldn't worry about getting sweat on them. Personally, I would not recommend submerging these headphones in water, but it's nice to know that they have a waterproof rating high enough to protect them from water splashing. Conclusion: In my opinion, the Censi Moecen cat ear headphones are the most stylish anime/neko/manga headphones that I have reviewed. 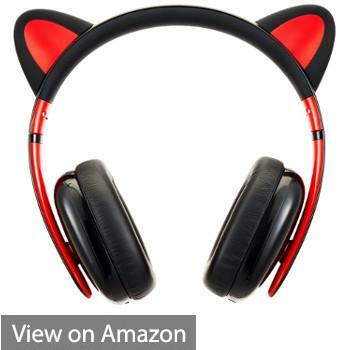 The detachable cat ears make them perfect for those times where you want a more standard look, and the absence of LED lights means that you will get a longer battery life (10hrs) than some of other headphones on this page. 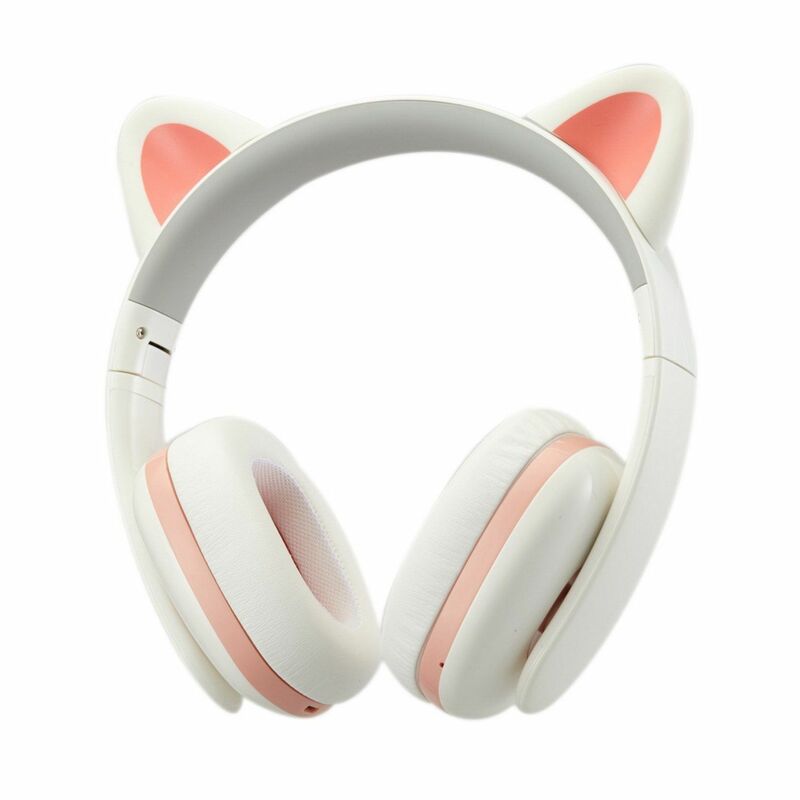 ​If you are looking for sleek, stylish cat ear headphones that have that neko anime style, the MongDa wireless Bluetooth hairband headphones from Padmate might be the perfect headphones for you. I'm not familiar with this brand (Padmate), so I was not sure what to expect. But I gotta say - these headphones are rad! First, they are much smaller than the other models of headphones I reviewed on this page. These headphones are more like the size of a standard hairband. They are very light, foldable, and easy to store. Second, these headphones do not have ear cups that fit over the ears. 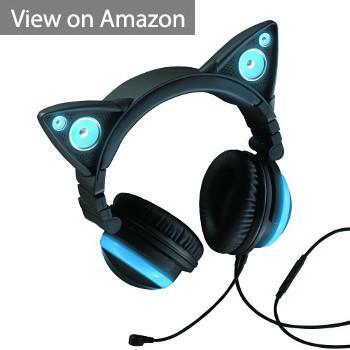 Rather, these cat ear headphones have <em>earbuds</em> (aka earphones), which fit inside your ears. When not using the earbuds, they sit on the side of the hairband, held into place magnetically. It's a genius design! Third, these in-ear headphones are wireless with Bluetooth technology, and they have a built-in microphone. Finally, the cat ears light up! That's right - this hairband contains "breathing" LED lights! If you are looking for LED headphones that are lightweight and easy to store or carry, these headphones are for you. These are the only cat ear headphones that feature a protective case that doubles as a powerbank. 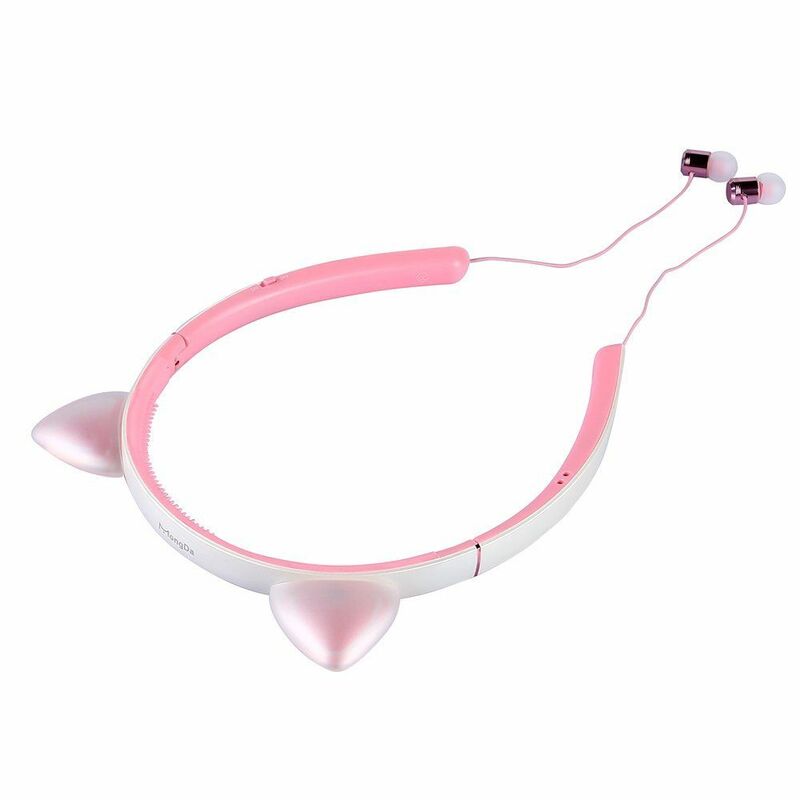 ​Currently, the MongDa headphones are only available in the pink and white color combination. 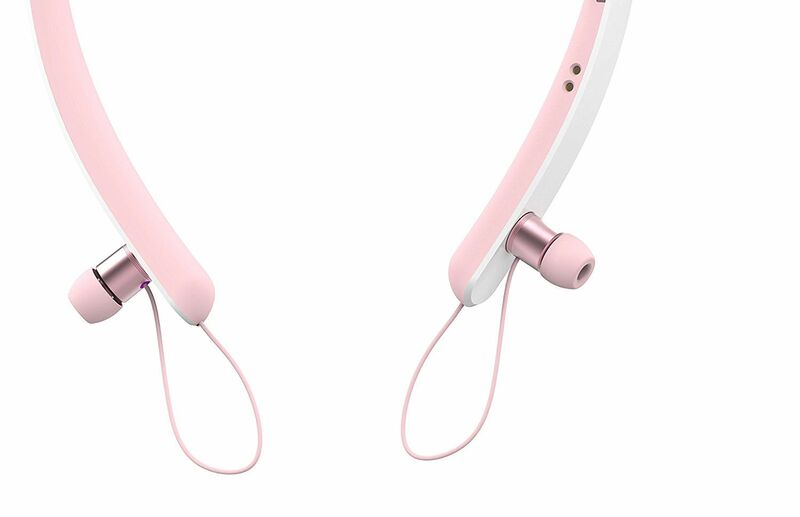 I think Padmate will eventually create additional color options, but for now they only offer these headphones in the the pink/white color option. Overall, these headphones are like a mix between the Censi headphones with removable cat ears and the Brookstone /Axent Wear headphones with LED lights. You get the style of the glowing cat ears, but you can also get the detachable cat ears option. It's a great combination of features, especially if you are not digging the size of the Axent Wear over-ear headphones listed on this page. ​The sound of these headphones is going to be a little bit different from the other over-ear headphones I reviewed on this page, simply because these headphones are actually earbuds that fit in your ear. They have the CVC6.0 noise reduction technology, so you get the benefits of clear sound, whether you are using them for music or phone conversations. These headphones are also equipped with the ATP-X Lossless Sound Quality technology. ​One of the coolest features of these headphones is the protective carrying case. It's a 3-in-1 case that features a protective storage compartment, a mirror, and a USB power bank. It's very much like a makeup compact with a mirror - and you can charge it! It is a power bank, so you can use it to recharge your headphones if the battery runs out. What a great idea! Having additional power is always a good thing to have. I travel quite often, and I tend to need additional power for my laptop and my headphones. I have a powerbank that I use specifically for my phone. Having a powerbank for my headphones would be super helpful for me. These are the only headphones on this page that feature a protective case that doubles as a powerbank. Speaking of power, the battery life on these headphones is any where from 5-6 hours. It can vary, depending on if you're listening to music or talking on the phone and if you have the lights on or off, but ultimately you should expect to get 5-6 hours of use per charge. That is inline with what we are seeing in the LED headphones market. Headphones that are having to power speakers <em>and</em> LED lights tend to have half the battery life of non-LED headphones. Conclusion: If over-ear headphones are not your thing and you are looking for cat ear headphones with earbuds that can fit inside your ears, the MongDa hairband is perfect for you. These headphones are extremely light weight, have a 5-6 hour battery life, and feature glowing LED lights. You get all the anime / neko style in a hairband, and the storage case is also a powerbank! Some might prefer over-ear headphones instead of these earbuds. ​Coming in at #5 is the final Brookstone / Axent Wear product. This is the wired version of the model outlined above in #2. There are some key differences. Most notably, these wired cat ear headphones are roughly $30-$40 cheaper than the wireless version. The other notable difference is that the LED lights are not color-changing. These headphones come in 4 color options: blue, green, purple, or red. If you prefer to have one color on your headphones and if you don't care about the color-changing features of the wireless versions above, then you can't go wrong with these headphones. Personally, I like the green and blue. I think I'd have a tough time if I had to choose one or the other. Another key difference is the absence of the LED light blinking modes. These headphones do not flash or blink or light up to the beat of the music. They essentially only have an on/off option. The LED lights are either on or off. I really enjoy the flashing modes of the other headphones, but I still think these headphones look great with the lights on or off. ​While Axent Wear did not include Bluetooth built into this model, these headphones come with detachable boom microphone. So if you plan on using these headphones as a gaming headset, you still have that option. The microphone is easy to attach and detach. Personally, I'm really looking at these headphones only for music, so I'm not all that interested in the microphone for gaming. But it's there is you want to use it. The external speakers on these headphones are located in the cat ears. While listening to music in the earcups, you have the option of turning the external speakers on or off. If you turn the external speakers on, you will still hear music in the earcups, too. Personally, I'm really looking at these headphones only for music, so I'm not all that interested in the microphone for gaming. But it's there is you want to use it. ​During the unboxing, you will find items. First, you will notice the large, black protective carrying case. The inside of the case is specifically fitted and molded for the headphones, so it will certainly keep your headphones safe while not in use. Next, you will find the headphones, which we have discussed at length. They are super cool. After the headphones, you will notice the standard headphone audio cable. You will plug one end of the cable into the headphones and the other end into your music playing device (phone, tablet, laptop, ect...). Next, you will see the boom microphone that we discussed earlier. Finally, you will find the USB cable that is used to charge the headphones. As for the battery life of these headphones, you can expect to get around 5 hours per charge. 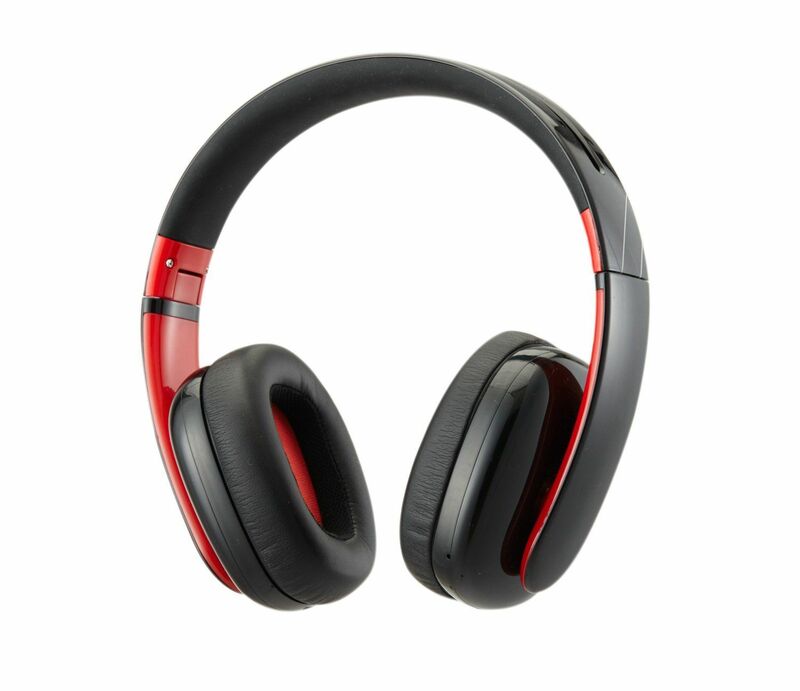 Conclusion: If you are a fan of the Brookstone Axent Wear cat ear headphones design but you want to save some money and you are cool with wired headphones, these are your best option. You still get the look, feel, and functionality of the Axent Wear design's cat ears with external speakers and LED lights, but you don't get the wireless features. Be sure to pick your favorite color! Less expensive than wireless version. These headphones are not wireless (No Bluetooth). The microphone is not a high quality gaming mic. ​The wired cat ear headphones from Censi Moecen are very much like the wireless version in the review above. The key difference is that these wired headphones are not wireless and they do not have Bluetooth technology. To use these headphones, you will need to plug them into your phone/tablet/laptop/device. Personally, I'd spend the extra $20-$30 to get the wireless version with the built-in microphone, but if you are looking to find the best deal and save money, these wired over-ear headphones will help you do that. 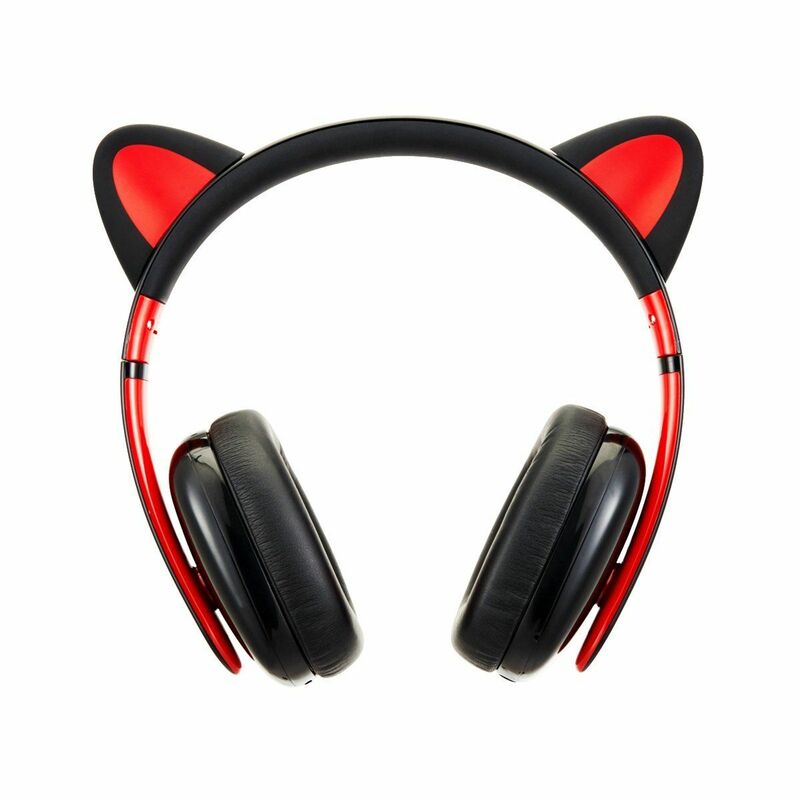 The best thing about these cat ear headphones is their style. I can't get over it. The design is so amazing. The cat ears are so simple and modest, yet they fit with the anime / manga / neko style so well. 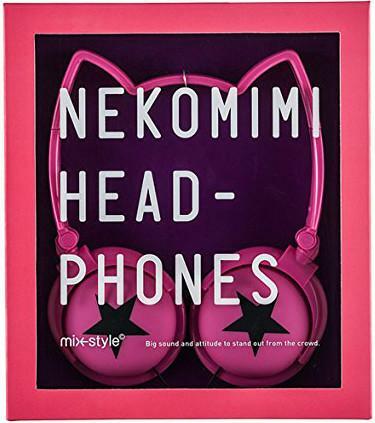 If you are a fan of nekomimi style, you should definitely consider these headphones. ​One of the design elements that might go unnoticed is the synthetic leather on the earcups. Also, Censi used a high-quality silicone on the top part of the headphones. Furthermore, the inner part of the earcups contains Swedish inert sponge, which really helps with the noise-cancellation aspect of these headphones. The synthetic leather helps keep the heaphones waterproof, as they are waterproof rated IPX4, which means they are protected from water splashing in any direction. I think IPX4 really means that these headphones are sweat resistant, which means they can be used when working out. So the extent of the waterproofing is more around sweat resistance. Sweat will not cause these headphones to malfunction, but I don't recommend using them in a situation where they will be submerged in water. These Censi cat ear headphones do not have a microphone built in, and you cannot attach a mic. Because there is no microphone, I wouldn't recommend these for use as a gaming headset. If you're looking for headphones that you will only use to listen to music or watch movies, these headphones are a great option. Because there is no microphone, I wouldn't recommend these for use as a gaming headset. If you're looking for headphones that you will only use to listen to music or watch movies, these headphones are a great option. ​Some people prefer these wired Censi headphones because they don't have any LED lights. From a style and money perspective, I can definitely understand the appeal of going with headphones that don't have any lights. They are certainly less flashy than the Axent Wear models, but they also have a classy, sophisticated style about them. You will have your own preferences, but I really like the look of these headphones because - for me - they fit more in the Anime Neko style. Inside the box you will find the headphones, a 3.5mm audio cable, the detachable cat ears, and a user manual. The box is so adorable, and unboxing these headphones was so much fun. Conclusion: The Censi Moecen wired cat ear headphones are a great choice if you are looking for basic wired headphones that sound great and look great. Aside from the detachable cat ears, these headphones have no frills (No Bluetooth, no mic, no LED lights). If you're looking for headphones that are going to be used for listening to music, save yourself some money and go with these. ​If you are planning a trip with the kids, headphones are a must, especially for long car rides and plane flights. Whether you are going on a family trip or simply looking for a gift your kids will love, finding headphones for kids can be a challenge. Finding stylish, cool headphones for kids can be even more difficult. 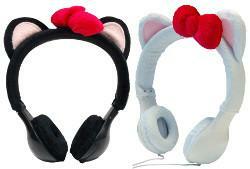 The BoostCare cat ear headphones from iClever were specifically designed with kids in mind. When I first saw these headphones, it was clear that safety, durability, and comfort were primary factors in their design. Most adult-sized headphones are simply too big for kids. iClever created the BoostCare cat ear headphones for kids 3-years-old and up, so they fit very comfortably on kids' heads. The headband and ear cups are extremely soft, and they will not cause any harm to your child's ear. Finally, the headphones are lightweight and the adjustable headband allows you to custom fit them for maximum comfort, safety, and enjoyment. Along with comfort and durability, safety was a critical design element​. The BoostCare headphones are built with volume-limiting technology that keeps the volume in the headphones less than 85dB. What I love about these headphones is that the volume-limiting circuitry is built into the headphones. You will not have to worry about clever kids disabling the circuitry or removing an external adapter. Having the technology built into the headphones is a game-changer because you will know that the sound will never go above 85dB. To give you a reference point, the decibel level of a hairdryer is in the range of 90dB. Lawnmowers are closer to 100dB, and standard headphones operate in the range of 110-120dB. By using headphones that max out at 85dB, you are helping to protect your child's hearing. Additionally, the BoostCare headphones comply with the United States Consumer Product Safety Improvement Act, and the headphones are also FCC compliant. The regulation compliance extends into the EU, as the BoostCare headphones also comply with the EU's RoHS Directive and the EN 71 safety guidelines. The durability of these headphones is also a key feature. You can twist, bend, and stretch these headphones. They will hold up to the wear-and-tear that comes along with kids using them, dropping them on the ground, and throwing them into backpacks. 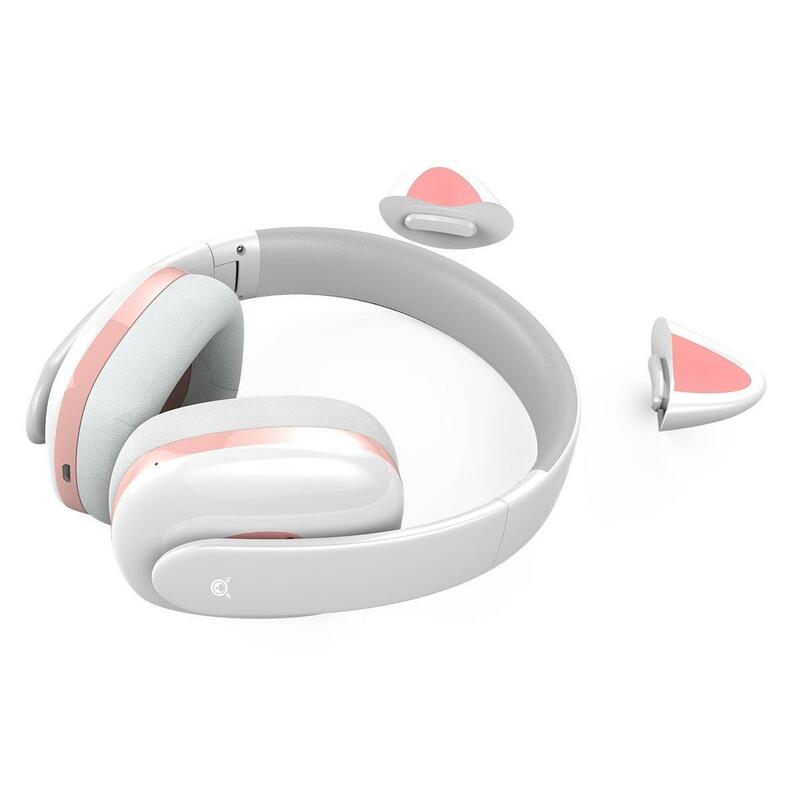 Furthermore, these iClever headphones are made with an environmentally-friendly, food-grade material, and the cat ears are made with soft silicon. Packaging: Out of all the headphones I have reviewed, these headphones had the most basic packaging. The box is sturdy and well-built, but there are no frills to the unboxing process with these headphones. You open the box, and you will see the headphones and the audio cable, which is attached to the headphones, and there isn't much anything else. Personally, I enjoy the unboxing process, but I completely understand the basic packaging with these headphones. They are for kids. My kids tend to rip things out of the box and then completely forget about the packaging. If the packaging was nicer, I'm sure these headphones would cost more. So I can understand the no frills approach on the packaging. Conclusion: If you are in the market for cat ear headphones for kids, the BoostCare headphones from iClever are a solid choice. They combine the safety of volume-limiting technology, the comfort of extremely soft material and an adjustable headband, and the durability of a product that can be stretch, twisted, and bent. For me, the volume-limiting circuitry is the most important feature of these headphones. iClever designed these headphones specifically for kids ages 3-12, and it really shows. 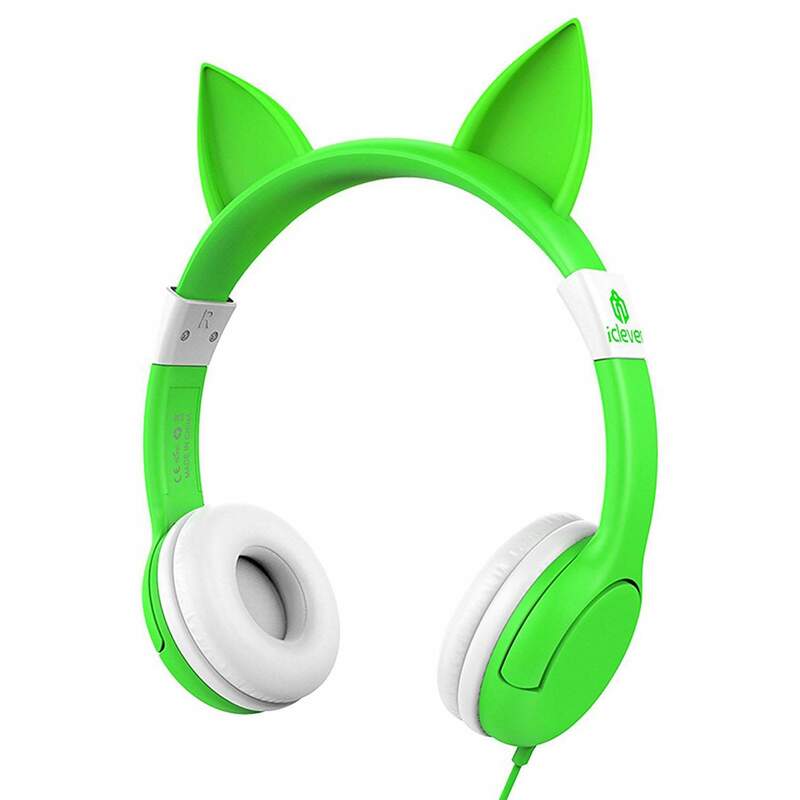 Rounding out my list of best cat ear headphones of 2019 are the Mix-Style Nekomimi headphones. 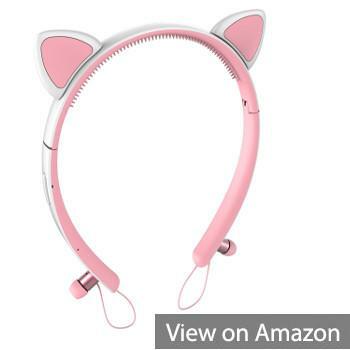 The most unique thing about these headphones is that the cat ears are essentially built into the frame of the headband. All of the other models I reviewed have cat ears that are more-or-less add-on's to the overall headphone frame. The Nekomimi headphones from Mix-Style are definitely unique in the way that they approached the design of cat ear headphones, and these headphones are definitely attention grabbers. My first impression of these headphones is that they are your basic, wired headphones - except for the cat ears! They sound good. In fact, they are a little louder than many of the other headphones on this page. 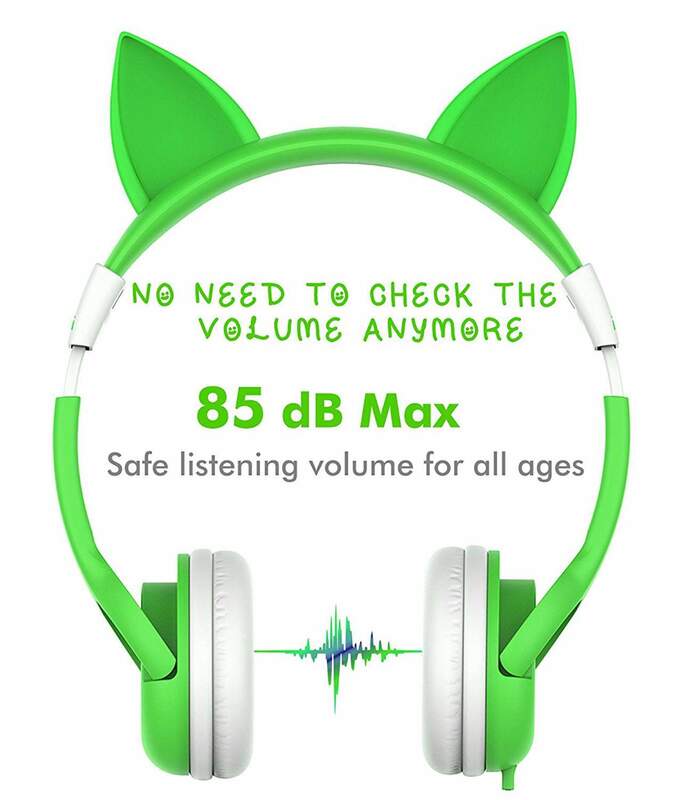 These Nekomimi headphones output 115dB ±3dB, and the other headphones on this page tend to output somewhere around 100dB ±3dB. 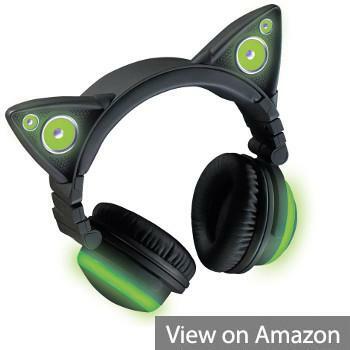 So if you are looking for headphones that can get a little louder, these might be the cat ear headphones for you. As mentioned earlier, one unique aspect of the performance of these headphones is their volume. They get a little louder than the other headphones on the list, as they peak around 115dB. Aside from the increased volume, I would say that these headphones perform as well as any of the other headphones on the page. I still think that the reason you might choose these headphones is because of their unique design, rather than their sound performance. However, if audio performance is one of your big decision factors, you won't go wrong with these headphones from a performance standpoint. Now for the unboxing process. First, the packaging on these Nekomimi headphones is colorful and fun. The box has a great design, and it's super simple to open. Aside from 2 paper inserts, the only thing you find in the box is the headphones. Personally, I really liked the unboxing process on these headphones because of how quick and easy it was to open the box and get the headphones out. Conclusion: If you are looking for a very unique design without having to pay for a built-in mic, LED lights, or external speakers, these might be the right headphones for you. From a value standpoint, you get great headphones with a stylish design without having to pay extra for features you may not want. They sound great, and they are definitely going one of the most unique designs I reviewed. 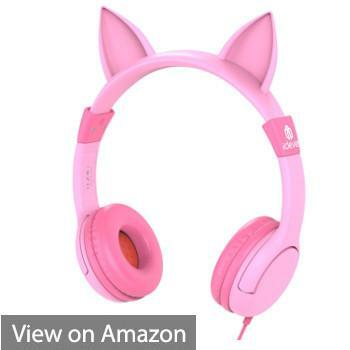 CatGirlHeadphones.com is a participant in the Amazon Services LLC Associates Program, and we get a commission on purchases made through our links.